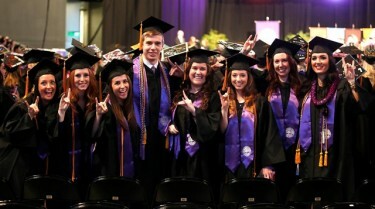 On a day when 530 Grand Canyon University traditional graduates were on cloud nine as they paraded up to receive their diplomas, numbers were the name of the game — and there were two ways about it. First, this was a first. GCU had never before held a winter commencement until Friday afternoon at the Arena, but the University’s ever expanding student population made it obvious a year and a half ago that it would become necessary. First-semester graduates previously had to wait until spring commencement if they wanted to participate in the ceremony. Second, there was the numerical magic of Justin Willman, who wowed the crowd in his entertaining commencement address, just as he had in the October ceremony for online graduates. His closing trick, in which the random numbers he got from four students equaled, when multiplied, the date and exact time (121,214,437, or 12/12/14 at 4:37 p.m.), is impossible to figure. The final days before graduation hit Savannah Cooper in waves. Kind of like her time at GCU. Cooper zipped her way through the College of Nursing and Health Care Professions’ new curriculum in only 16 months and still can’t quite believe how much her life has changed in that short time. Cooper knew when she was 16 that she wanted to be a nurse but wasn’t sure where she wanted to go beyond Clark College, the community college she attended in Vancouver, Wash. She had been accepted at four nursing schools when she came across GCU on the Internet. Cooper saw that the University’s nursing program is nationally ranked and she had liked Phoenix when she visited, so she looked into it further. Before long, she had made her choice. “I just knew that’s where God wanted me,” she said. Soon after arriving on campus, Cooper was selected as a Life Leader. This semester, she worked in the intensive-care unit at John C. Lincoln North Mountain Hospital in Phoenix and hopes to find work as a critical-care nurse there, in Portland, Ore., or, just to try it, New York City. 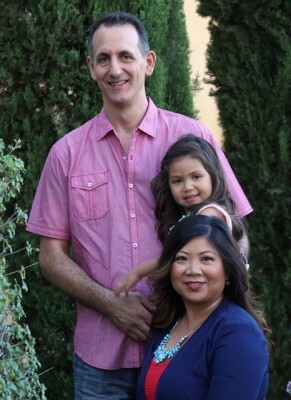 Michael Massoff believes his GCU degree proves that anything is possible. Massoff, 49, who graduated Friday with a bachelor of science in nursing, worked as a chiropractor for more than two decades. He lost his job during the U.S. economic collapse in 2008 and moved to Arizona in 2011 to open his own practice, but was forced to close after only a year. Massoff needed a new education but a return to school after nearly 28 years away from the classroom would be difficult. He had open-heart surgery in 2012, and met a nurse who influenced his decision to pursue a nursing degree. 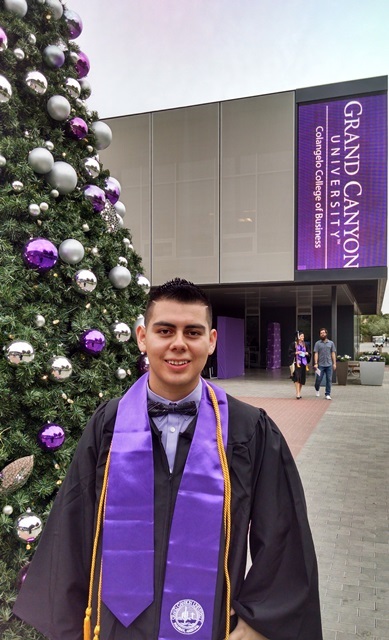 After being contacted by a University enrollment counselor, he knew a nursing degree at GCU was the perfect fit. “Going back to school after that long was definitely an interesting transition,” said Massoff, who completed the fast-track nursing program in 18 months. “When I first went to school, we didn’t have computers and we went to physical libraries. Massoff said he spent a lot of time in the GCU Library and on the phone with tech support to learn to navigate the University’s online learning environment. He credits his ability to graduate to the help of GCU staffers and the support of his wife and 4-year-old daughter, Jane. Magdelena Hines deserves the mother of the year award — and her diploma. Hines, who graduated with her bachelor’s degree in special education, quit her job as a medical office manager to return to school to help her daughter overcome a learning disability. Her daughter Amanda, now 25, was in high school when she began to struggle in class. Magdelena Hines said she wouldn’t allow herself to watch Amanda struggle and not be able to help her. Hines already had an associate degree in liberal arts from Glendale Community College but had to adjust to being a student again after years away from the classroom. She enrolled at GCU four years ago, and said that when classes became difficult, Amanda was always there to keep her going. “She may have had a hard time reading but she could always read the Bible,” Hines said. “Whenever I had a hard time with class, she would always be there for me with a verse or a prayer. Liz Martin, GCU global outreach manager, volunteered at commencement and met Hines before the ceremony while handing out regalia and honor cords to graduates. Hines’ story brought tears to her eyes. “Her story is so inspiring that she would want to go back to college to help her daughter,” Martin said. The idea of helping children develop life skills always appealed to Alexis Sonnenberg. She remembers telling family members when she was little that she wanted to be a teacher. 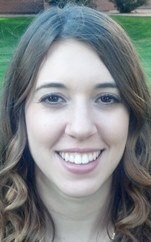 Sonnenberg, 22, recently completed her student-teaching assignments at Colorado Springs Christian School and St. Luke’s Children’s Center in Colorado. She graduated Friday with a bachelor’s degree in early childhood education. 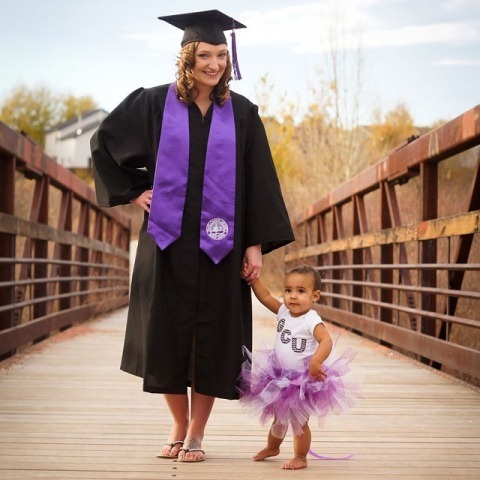 Sonnenberg said her graduation is especially sweet because she completed her degree while raising her daughter, 1-year-old Maleyah, and navigating some unexpected obstacles while preparing for student-teaching assignments. As things got intense with upper-division coursework, she was still learning to be a mom. That added challenge strengthened her resolve to be a thoughtful, well-trained teacher. Originally, Sonnenberg was set up to student-teach in Tucson. But she was unable to do that, due to a family issue, and instead moved home to Colorado in the midst of her undergrad studies. On a very tight deadline, GCU staff helped her quickly locate a new assignment in a new state so she could complete two 8-week classroom stints and stay on track to graduate. Sonnenberg, who wants to teach first graders in Colorado, said GCU staff and College of Education faculty were always willing to help her achieve her goals. “It seemed they were always willing to help you be successful, no matter what,” she said. Even though he grew up in west Phoenix and went to grade school just blocks from GCU, Juan Juarez said he wanted to leave Arizona for college. He was ready for something new, and he had the grades to get into some top schools in other states. That included the chance to graduate, Juarez said, with no debt, which he’s particularly proud of as the first in his family to graduate from college. The out-of-state schools would have meant higher tuition. Deciding on GCU also gave him the ability to earn valuable work experience. Juarez, who graduated with a 3.95 GPA, had news internships with CNN in Washington and NBC News in New York, working on video stories and online packages geared toward Latino audiences. Over the summer, he wrote an online article to accompany a jarring NBC News package titled, “Inside La Gran Familia Group Home – Mexico’s ‘House of Horrors.’” The article detailed accusations of rampant abuse and child neglect. Juarez said it was gratifying hearing feedback about such a unique international watchdog story and seeing it pop up on Google alerts. The internships whetted his appetite to become a professional TV journalist. “My goal is to be working for a news organization and covering stories, traveling different places in the U.S. and globally,” he said. Studying in both the digital film production and communications programs provided Juarez with a range of skills, from technical editing and production skills needed to work at a news organization to the essentials of interviewing and storytelling. Now, he’s prepared to earn that next professional byline. Bedazzled and decorated mortar boards and homemade leis appear to be the all the rage in the world of commencement coiture, but a pair of GCU graduates had a different way of displaying their personal style — and family pride — at Friday’s ceremony. 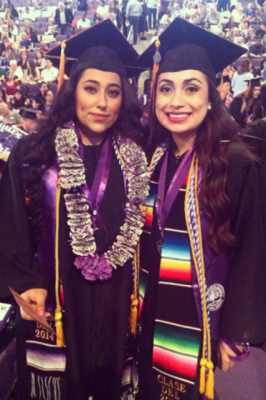 Nursing graduates Janeth Sanchez, 27, and Xiomara Palmera, 22, wore multicolored Hispanic serape stoles made from Mexican materials beneath their traditional purple GCU stoles to represent their heritage and honor their families. The stoles read “Clase De 2014” (Class of 2014). 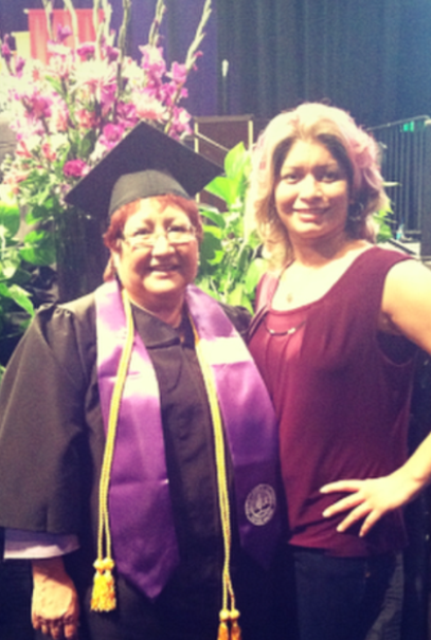 Sanchez, a native of Mexico City, and Palmera, a second-generation Mexican-American, honored family members who were among the first generation in their families to graduate from college. Sanchez’s sister and Palmera’s cousin graduated from GCU. “These were something our family members wore when they graduated college — my sister wore one last year — and the tradition was passed down to us,” Sanchez said. 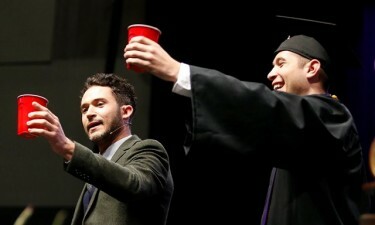 Justin Willman had never done a commencement address before he performed for GCU’s nontraditional students in October. “I was humbled to be asked to do that in the first place,” he said. “But I really was kind of pleasantly surprised with how many resonated with the message and afterward quoted things right back at me and really seemed to get it. As in October, he told the crowd how, as a 14-year-old, he broke both of his arms when he was riding a bicycle while wearing rollerblades and fell off. A doctor recommended that he do card tricks to improve his manual dexterity, and a career was born. But Willman tweaked his act and his message a bit Friday, partly to provide something new and partly because he was speaking to traditional rather than nontraditional students, who tend to be older. He left ’em laughing … and thinking. Other commencement stage standouts were student speaker Sandra Rivera, who received her degree in accounting, and the GCU Guitar Ensemble, which provided the pre-ceremony music and performed the national anthem.